The Blueair 203 doesn't have to be restricted to just the bedroom. It’s also great in small areas and workspaces to get rid of pesky airborne allergens, such as pollen, dust, smoke, and mold spores. All that remains? Impeccably clean air. The union of visually pleasing form and effective function is a hallmark of Swedish design, and Blueair is no exception. 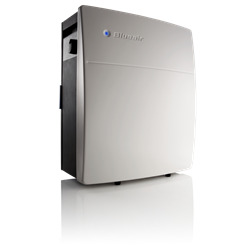 The Blueair 203 is designed for maximum performance in small rooms. Our Swedish design is not only attractive but built to last. We are known for our durable construction that is made of galvanized steel and is powder coated for durability and environmental protection that produces no chemical off gassing. The air purifier housing is easy to clean, and won't pick up grime and oily stains the way plastic may. The Blueair 203 Air Purifiers intake air through the back of the unit. The air is passed through the pre-filter where large particles are trapped, then through the electrostatic HEPA-type filter where the small particles are trapped, and then through the ionization chamber where the air mixes with negative ions. Negative ions are then released with the clean air through the top of the unit. The ions collide with the particles in the room air and the particles become charged. When the air cycles back through the unit, the charged particles cling to the electrostatic filter media. The combined filtration technologies allow the Blueair Air Purifiers to achieve 99.97% filtration efficiency, down to .01 microns. You will notice there are two different units of the model 203 available. The differences are. Once you purchase the Blueair 203 of your choice, you can replace the filter you originally chose with the other without modification or purchasing additional parts. Blueair 203 with Particle filter is the ideal choice for allergy sufferers and other health-conscious individuals that need high-efficiency particle removal. The unit contains one polypropylene 3-stage progressive filter that contains millions of ultra-thin fibers with each state trapping progessively smaller harmful particles as they pass through the pleats. The Blueair 3-stage progressive filter effectively removes every type of particulate air pollutants, including allergens, pollen, mold spores, dust, pet dander, bacteria, and viruses. Blueair 203 SmokeStop Unit is the ideal choice for allergy sufferers and other health-conscious individuals that need high-efficiency particle removal plus gas and odor control. The SmokeStop filter is a progressive carbon filter with a honeycomb-type structure that improves airflow and has hundreds of odor and gas absorbing carbon pellets. The filter contains 2.0 lbs of coconut shell activated carbon impregnated with a 70/30 blend of Potassium Hydroxide (KOH) and Potassium Iodide (KI). The carbon eliminates volatile organic compounds (VOC), which are responsible for odors.